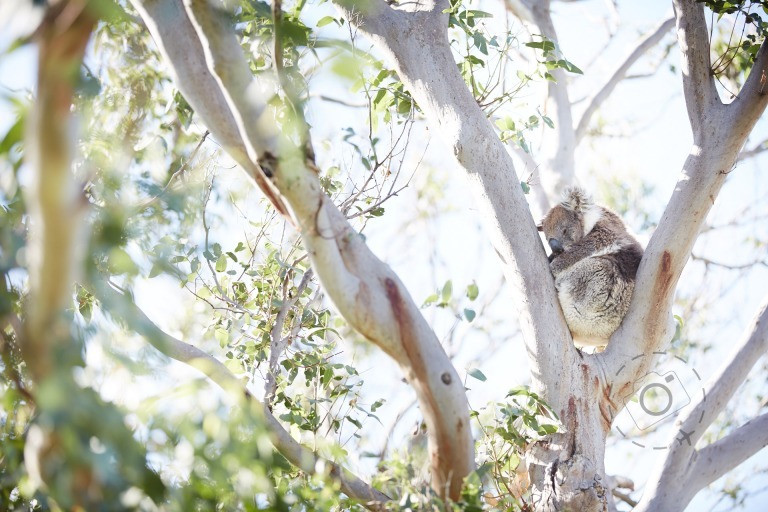 "Koala spotting at Cape Otway"
As photographers we have a choice to pursue those precious moments that most matter in life, or employ our art to make careful copies in reverence to the real thing. I have to give full credit to Anthony McKee for inspiring this opinion piece. Anthony is a deeply appreciated photographer whose skills extend far beyond the mere act of holding a camera. The most important work as a photographer takes places long before you head out and shoot, and Anthony has recently lamented a rising lack of patience by contemporary photographers. As we have become flooded with images online and on our smartphones, we have equally lost the art of capturing the moment of true importance. We no longer wait with journalistic determination to be in the right place at the right time, opting instead for contrived convenience where we make the shot happen as we want. Somehow we've become so good at engineering the shot that we no longer delve into the fabric of our society in search of the real moments, real situations, that hold real value and real meaning. It goes deeper than the difference between studio lighting and "available light". I've personally spent decades avoiding the studio because moments don't happen on demand, because I want to chase the real thing and experience that moment. My particular connection to the art of photography has leaned heavily on being in the real world and allowing the unexpected to present itself. I have enjoyed a lifetime of moments and every now and then I succeed in committing some to the camera. I make a conscious effort when travelling to embrace a culture or a destination as it truly is, to avoid being too prepared and enjoy the serendipity of the unknown. To me the great treasure of being a traveller is not knowing exactly what is around the corner - hence the great skill as a photographer is being patient along the journey yet ready to shoot an unexpected moment. When putting together a journey I am essentially "planning to surprise myself". You don't have to leave your home to have a journey however. Our own backyards are rich in inspiration if we give it consideration. Life is happening all around us, filled with moments of importance that beckon the photographers talent. The closer to home these moments are the more we have to work to become conscious of them. Moments are easy to overlook by way of familiarity. A beautiful series of images by Timothy Archibald centres on the unusual moments that arise in the life of his autistic son, a collection that is subtle yet powerful and filled with devotion and care by the father. Archibald's images are true moments, captured in the most personal of spaces and reflecting his deep awareness of the struggles endured by his son. In contrast I have spent comparable effort in recent months instagramming photos of my coffee. And they weren't even very good photos. The nature of social media takes us towards conformity and acceptance, a hidden twist in the high speed evolution that quickly nudges aside attempts at divergence in favour of crowd pleasing. It's a pernicious side effect of the digital revolution, the massive increase of volume along a single direction that starves oxygen from other ideas and ideals. Food is a passion for me, and naturally I am drawn to embrace it with photography. I recently made a review of my Pinterest collection to see if any patterns had emerged in my preference for foodie shots. I wrote a list, then I wrote a bigger list. I gave names to different kinds of food shots when I saw them repeated. And soon there were no food shots in my conscious mind that didn't belong on that list. My vision of food photography had been reduced to a recipe, like a shelf in the cupboard with a dozen premixed spices. The moments I seek when travelling are what I miss in my foodie shots. Composition and use of light can all be learned and perfected, but it's the moment itself that matters most. Where are these moments when shooting a box of macarons? Unless I'm in the kitchen of a pastry chef to watch him work the ingredients then maybe all else is faux. Unless the cake is lit with candles and about to be blown out by the birthday boy then my photo is just a cake and it could be any cake and what's so special about this cake? On a recent workshop I talked about the importance of story, and trying to bring that into food photography. We have a chopping block and some chillies on a wooden floor. A basket of garlic and shallots kept the knife company and a few chillies were artfully arranged to create some negative space extending from the chopping block. Just a few, not too many. One outlier completed the scene, as though this chilli was making a bold bid to escape the terrible fate awaiting him on the block. We were in fact manufacturing a moment. In the ordered environs of a cooking school we made for ourselves a piece of reality from a handful of constituent parts. Most commercial photography is handled in this way. Carefully rearranged produce and people presented to look real, to represent moments that would not otherwise exist. That's not to say a chilli placed on the floor can't be artistic, indeed it can be immensely creative and deeply rewarding. But I cannot call this capturing the moment, I'm simply manufacturing it. My best food photography doesn't come from formulaic styling from elements, but from shooting around a table that has been set by the chef himself. I always ask them to set a table for the customer, not for the camera, and then I pull out the light and love for what has been offered. The results are more genuine and more generous. Just a few months ago I found myself travelling with a bunch of dedicated landscape photographers, people who have little opportunity to manufacture the scene by virtue of scale. They cannot throw studio lights across a fjord in Norway, have no control over the cloud cover at sunrise and are frequently thwarted by rain and snow. Once again, we can learn a lot from the patient art of landscape shooting. On this trip we chose the hardest subject of all, the Aurora Borealis. Night after night we plotted to chase the lights, watching for weather windows and waiting for aurora activity. After a few good showings we had the basics of shooting the northern lights sorted out, and just wanted to bring together the magnificent event with some stunning landscape scenery. People had travelled across the world, stayed up late each night and stood around in -6 degrees temperatures in the hope of seeing a green glow illuminate the stars. On the third night it happened on a massive scale. A few of us jumped in the car and drove out to a quiet fjord. The tide had gone out and we walked across the beds of seaweed to reach the shallow water, all the while above our heads the aurora was raging. You never know if you'll get three minutes or three hours with these events, but we got the latter. We filled our cards and drained our batteries in the night, euphoric with the chase and immersed in the moment. Having worked so hard for the shot is what made is special. Countless other photographers that night would also be capturing magical scenes, that's the nature of the Arctic Aurora. Everyone's invited to join the party. But first off you have to be there. You have to travel far from home, you have to plan for a week or more in the hope of matching clear skies with solar winds, and you have to stand out in the cold without any idea when the show might begin, or end. That moment is one I will never forget, especially sweet for having captured some of it on digital film.